A small pig lives in a large house with a boy who tells him how to dress and what to do. 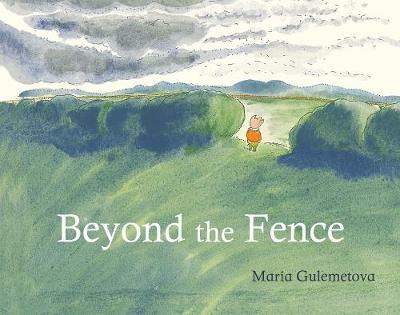 One day, however, he meets a wild pig who introduces him to life 'beyond the fence'. Quirky and charming, this debut book contains important messages about individuality and making your own c... read full description below. A small pig lives in a large house with a boy who tells him how to dress and what to do. One day, however, he meets a wild pig who introduces him to life 'beyond the fence'. Quirky and charming, this debut book contains important messages about individuality and making your own choices. Winner of Shortlisted for the CILIP Kate Greenaway Medal 2019. Maria was born in Sofia, Bulgaria. Her father was an illustrator, and her mother is an art historian. Their house was full of beautiful illustrated books, and she remembers spending many hours absorbed in the pictures. She attended a specialized high school, majoring in Textiles, and went on to study Textiles at the Art Academy in Sofia. Gradually, however, she discovered a love of communicating ideas through stories, which led her to the wonderful MA course at Anglia Ruskin. Currently she lives in Eugene, Oregon, with her husband and two kids, where they enjoy plenty of rain, wildlife and natural beauty. Maria was born in Sofia, Bulgaria. Her father was an illustrator, and her mother is an art historian. Their house was full of beautiful illustrated books, and she remembers spending many hours absorbed in the pictures. She attended a specialized high school, majoring in Textiles, and went on to study Textiles at the Art Academy in Sofia. Gradually, however, she discovered a love of communicating ideas through stories, which led her to the wonderful MA course at Anglia Ruskin. Currently she lives in Eugene, Oregon, with her husband and two kids, where they enjoy plenty of rain, wildlife and natural beauty.